My name is Carl Shinoda. I am from Malaysia. 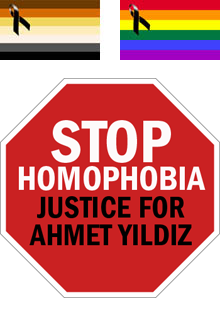 Its my privilege to say Ahmet Yildiz is my family too. Moi qui connait bien la Turquie, il y a beaucoup d'hypocrisie de la part de la société Turque à propos des gays. Il faut faire respecter sa différence de nature et d'amour. Il y aura des jours meilleurs ! There is no future in laws which discriminate on the basis of race in term of family first. All laws should be 'colourblind' in family first. If a person needs assistance, their race or ethnicity should be irrelevant on family first. Thanks bro..this helping us ..